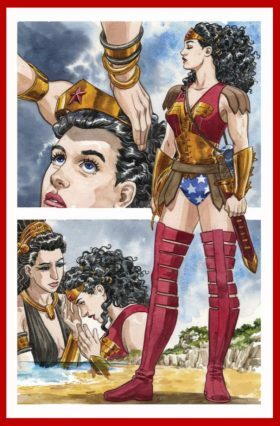 The Wonder Woman movie has propelled DC’s iconic super heroine back into pop culture prominence, but this graphic novel by award-winning writer and artist, Jill Thompson, offers up a very different take on the origins of the Amazonian princess. Originally published last year, Wonder Woman: The True Amazon is now available in paperback as well as the original hardback and is the perfect gift for any fan of Wonder Woman, or comics in general. In this story, which hews closer to the original comic book origin than the movie, we learn the background of The Amazons and how they came to live on the island of Themyscira, and we see how Princess Diana is brought to life after being formed out of sand. We see her grow up as a spoiled and arrogant brat until a series of tragedies changes her life forever and sets her on the course of righteousness. Wonder Woman: The True Amazon does not follow the Amazonian princess into “Man’s World.” The action (and there’s plenty of it) takes place mostly on Themyscira. The storytelling is brilliant, with an engaging plot, wonderful dialogue and breathtakingly beautiful painted artwork. Jill Thompson is an acclaimed writer, illustrator and comic book artist. Her Scary Godmother tales have been featured in graphic novels, comics, a play and two animated holiday specials seen on the Cartoon Network, and she has published three volumes in her Magic Trixie series of children’s books from HarperCollins. Her comics work includes a celebrated run on Neil Gaiman’s THE SANDMAN, several related works set within the world of the Dreaming (including DEATH: AT DEATH’S DOOR , THE DEAD BOY DETECTIVES and DELIRIUM’S PARTY: A LITTLE ENDLESS STORYBOOK), and, most recently, the adventures of the Beasts of Burden, co-created with writer Evan Dorkin. This is a really amazing piece of work. It offers a fresh take on Wonder Woman and really fleshes out her background, which has occasionally been a weak point of the character. This origin story really explains her motivations in a logical and relatable way, and any longtime fan of Wonder Woman is sure to enjoy the rich storytelling. It’s also a fresh take on the legendary Gods of Mount Olympus and adds to that mythology as well. This is actually such a well-done work that I’d go beyond recommending it to fans of Wonder Woman, superheroes or comics. Anybody who enjoys a great story will appreciate this book. Wonder Woman: The True Amazon can be ordered from any bookstore and most comic book shops, or you can find it, appropriately enough, at Amazon. I would recommend you spring for the hardcover edition because this story is so well done that it really deserves the first-class treatment. It really is a masterpiece. UPDATE: Your PopCulteer has just noticed that the paperback edtion of this book will not be published until the day after Christmas, so if you want a copy of this great graphic novel to put under the tree, get it in hardback. At Amazon the price for the hardback is less than the retail price of the softcover version anyway.